Cities across India are undertaking a variety of land-use, transportation and housing projects, but most plans do not consider the connection between the built environment and the health of residents. This is a mistake, according to new research by the University of Massachusetts and the Indian Institute of Technology Delhi recently published in Environmental Research. More than 99 percent of India’s residents live in areas that do not pass the World Health Organization’s air quality guidelines. Taken together, India and China accounted for half of all deaths attributed to ambient air pollution worldwide in 2015. In many Indian cities, large numbers of people live in close proximity to road traffic and spend a great deal of time commuting. Their exposure to pollutants can vary based on neighborhood type, distance from the city center, and mode and length of commute, but these are all variables that policymakers can address. Land-use and transportation planning play important roles in influencing urban air quality. Daily exposure to air pollutants just from traffic in India can be as high as total daily exposure from all sources in developed countries. But only a limited number studies have been conducted on the details of exposure to traffic-related pollution in India and they have produced somewhat conflicting results. Mode of transport and duration of travel are the two main determinants of exposure for commuters, with other factors playing a smaller role, including land use around the route, driving conditions (e.g., idling times and smooth vs. stop-and-go traffic) and total traffic volume. 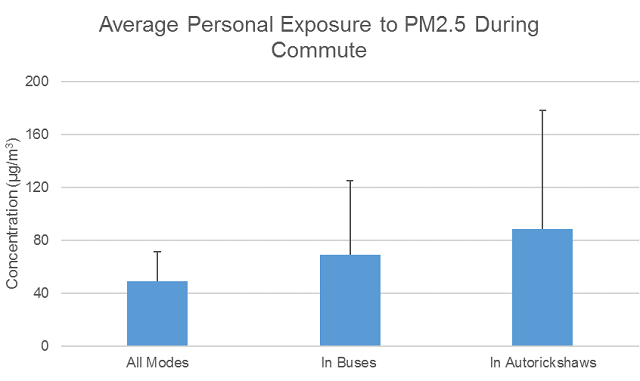 Since personal exposure takes into account pollution levels as well as time spent in the specific environment, longer commute times (due to traffic jams, congestion, etc.) can also contribute to higher exposure levels. Overall, results have varied but air-conditioned cars and buses seem to have comparatively lower in-vehicle pollution levels than open-air vehicles, bicycling, or walking. To help fill-in the data gaps, our study focused on in-vehicle exposure to fine particle pollution (PM2.5) and black carbon (or soot) in different modes of transport, particularly buses, auto-rickshaws and cars. Air quality data was collected along a 22-km (13.7-mile) stretch of Delhi, India’s capital where the average person spends between 60 to 120 minutes a day commuting, including parts of a highway as well as commercial and residential neighborhoods. In addition, personal exposure data was collected for a group of volunteers to understand their daily activity patterns and associated exposures. The study concluded that auto-rickshaws, a popular mode of transport in Delhi and elsewhere in India, are associated with very high levels of air pollution exposure, both for fine particles and soot. On the other hand, air-conditioned public buses running on compressed natural gas have the lowest in-vehicle concentration of soot particles. Measurements for all modes were collected by a network of volunteers in Delhi, riding a mix of cars, auto-rickshaws, buses and walking. Measurements for exposure in auto-rickshaws and buses were made by research staff. 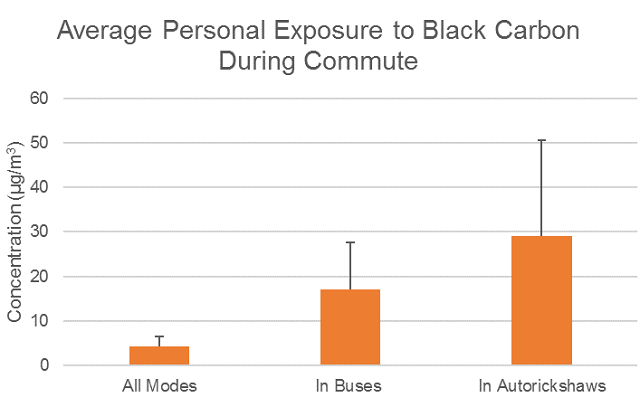 It was also evident that exposure during commuting can vary significantly from person to person: mode of transport, duration and route of the journey are all key factors. Furthermore, ambient levels of fine particles and soot were found to be strongly linked with in-vehicle concentration for auto-rickshaws, but it wasn’t as significant for buses. In simpler terms, on a typical morning in Delhi, travelling to work by auto-rickshaw is likely to expose you to a higher concentration of fine particles, compared to the same journey in a bus or a car with the windows rolled up. This is not entirely surprising, since auto-rickshaws are open vehicles and there are no barriers for protection. Furthermore, in-vehicle concentrations are often higher during traffic jams when vehicles are idle (typical idling times for Delhi vary between 18 and 37 percent of the total driving time). 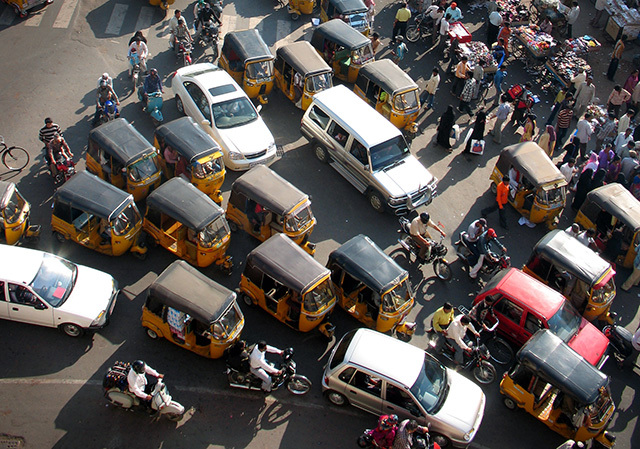 Air pollution exposure in auto-rickshaws may be even higher elsewhere. Delhi’s public transportation and buses, as well as auto-rickshaws, run on compressed natural gas, which reduces soot emissions. Elsewhere, buses and auto-rickshaws use high-sulphur diesel fuel. Exposure levels while in auto-rickshaws then may be higher in other cities. Furthermore, the general preference of women to use auto-rickshaws over buses for personal safety means they can suffer from even higher levels of exposure. India will be home to 14 percent of the global urban population by 2050. To minimize health effects, it is imperative that pollution control strategies (not to mention climate change mitigation) take into account the many ways people can be exposed to fine particulate matter, soot and other air pollutants. Urban improvement and redevelopment projects that are focused on the promotion of public and non-motorized transportation, such as the government’s AMRUT program, should adopt reduction of air pollution exposure as a basic design principle. Better integration across national, state and local urban policymaking can pave the way for long-term improvements in breathability. A careful assessment is required to understand in-vehicle exposure with respect to land use and traffic characteristics as well as fuel choices. But it is clear that investments in infrastructure that reduce travel times and create distinct motorized traffic, bicycle and pedestrian thoroughfares can improve the health of residents and commuters in multiple ways. Pallavi Pant is a postdoctoral research associate at University of Massachusetts, Amherst, and the lead author of “PM2.5 Exposure in Highly Polluted Cities: A Case Study From New Delhi, India,” with Gazala Habib, Julian D. Marshall ad Richard E. Peltier.